Valdosta City Hall is located at 216 East Central Avenue, Valdosta, GA 31603; phone: 229-242-2600. Photo: Converse-Dalton House, ca. 1902, 305 North Patterson Street, Valdosta, GA. Listed on the National Register of Historic Places in 1983. Photographed by User:Ebyabe, 2010, [cc-by-2.5 (creativecommons.org/licenses/by/2.5/deed.en)], via Wikimedia Commons, accessed June, 2015. Valdosta, seat of Lowndes County, is one of the most prosperous small cities of Georgia. A railroad center with seven branch lines of three systems, it has extensive railroad shops. Other industrial establishments include cotton mills, machine shops, feed mills, peanut shelling plants, fertilizer works, saw mills, planing mills and a barrel factory. 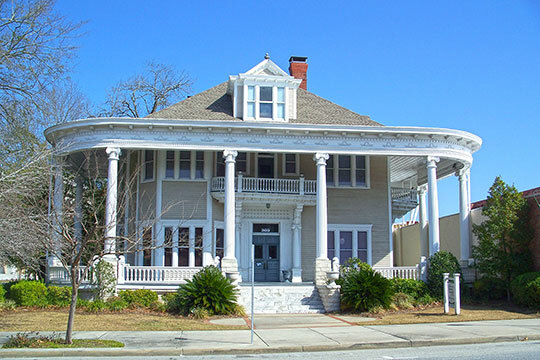 Many of Valdosta's houses have white columns and broad verandas in the old southern style, with later additions of porte cocheres, bay windows and octagonal turrets. In the newer sections are brightly colored Spanish mission type bungalows in groves of oak, pine and palmetto. In this hospitable, informal city, sports are popular, and the country club, with its tennis courts and golf course, is the center of social life. The well-wooded countryside affords excellent hunting and 85 clear water lakes within easy driving distance provide abundant water sports. Although the town is not a winter resort, it is becoming increasingly popular as a stopping place for travelers on the way to Florida. Before 1860 the county seat, about four miles west of the present site, was called Troupville in honor of Governor George M. Troup. When the right-of-way of the first railroad through this section was surveyed, the engineers left Troupville off the route. The citizens lost no time in moving to the railroad, and since they wished to honor the Governor still further, they named the new town for his estate Val d'Osta. Georgia State Womans College, Patterson Street, conducts classes in five white stucco buildings of the Spanish mission type of architecture; the 60 acres campus is wooded with groves of pines. Opened in 1913, this institution at first offered only 2 years of study, but soon arrangements were made for a 4-year college course and the conferring of the A.B. Degree. The school has an enrollment of about 340 and a faculty of 22.